Between 1896 and 1932, Iowa native Joseph S. Connolly staged 73 head-on train wrecks before large thrill-seeking audiences at state fairs and other public events nationwide. Connolly, known as Head-On Joe, boasted that he deliberately destroyed 146 old steam locomotives during these collisions and never had anyone injured in the process. 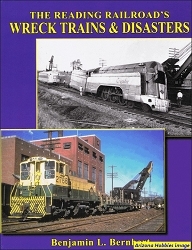 This book looks at both the career of this professional engine wrecker and the techniques used in staging a train wreck for public entertainment. Dramatic head-on locomotive collisions staged by other promoters are also detailed using 40 rare illustrations and informative text. It's a look at a largely forgotten but still fascinating part of railroad history. South Platte Press, softcover, 48 pages, 8.5 x 11 x .25 in., B&W photographs and illustrations.